Use our dedicated case studies focusing on the poplulation of India, and the population of Japan, to help understand the key differences between a youthful and ageing population. o Ageing population: There is an increasing proportion of older people in a population. The population pyramid is ‘top heavy’. This tends to occur in more economically developed countries (MEDCs) where there is better medical provision so people live longer combined with educated women who are more career driven. o Youthful population: There are more young people than old people in a population. The population pyramid is bottom heavy. This tends to occur in less economically developed countries (LEDCs) where life expectancy is lower and families have more children to help increase the family income through working. o Stable population: Stable populations are found where fertility and mortality rates are equal (or close to equal). Japan is an Island in the Asian pacific and its ageing population is causing huge problems throughout the country. Currently over 25% of Japan’s population are over 65 and families on average are having only 1.4 children. This creates the issue that in some areas there are more people who need to be cared for than are available to care for them. Some worry that this low birth rate could mean that the Japanese population will become extinct in a not too distant future. Therefore, the government are having to implement all sorts of ideas in order to increase the birth rate. For example, the state sponsors speed dating to help young people find love and college students have actually invented a robot baby named “Yotaro” in an attempt to stir up human emotions so that families might want a real baby for their own! The reasons for Japan’s ageing population are very complicated. Firstly average life expectancy in Japan is 83 - this means that people live to be very old in the country. This puts a strain on young people, as it is very difficult to start a family if you are having to care for your ageing parents. A lot of Japanese adults still live with their parents until they are up to 40 years old because property can be very expensive, meaning that romance can take a back seat to a good career and home life! Japan is in serious trouble if it does not find a way to increase its population. It is estimated that Japan requires an influx of around 60,000 working age migrants a year to combat this issue of extinction. Therefore in the late 1980s, although Japan has a strict migration policy, they began advertising for anyone of Japanese descent living in Brazil to emigrate and work. This originally worked very well and seemed very attractive to both parties. However eventually issues started to arise as the Brazilians did not share the same cultural identity as the Japanese, and in 2009 the Brazilians were offered attractive financial packages to return home. India is a large country in the south of Asia with huge disparities between the wealth of its people. 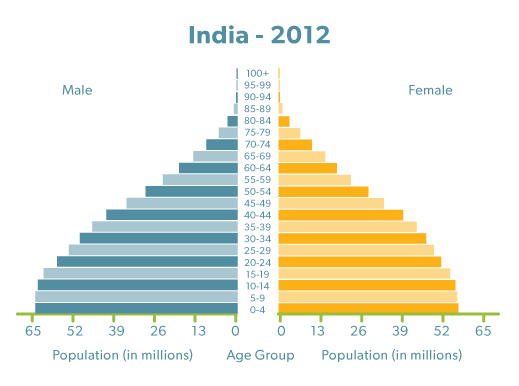 India has a population of almost 1 billion and as you can see from the population pyramid, the majority of those are young people. The country’s population has been rapidly growing with it increasing by 181 million people in the last 10 years. If it continues at this rate India could become the world’s most populated country by 2020. There are many reasons for a youthful population in India, one being that infant mortality rates are falling. As the country becomes more developed more babies are surviving infancy. Over the past 10 years this has increased by around 30%! In rural areas it is also common for families to have 4 or more children as contraception isn’t as readily available or they require more children to work in family businesses (such as farming). Youthful populations can cause many problems such as increased competition for jobs, excess pressure on resources and facilities such as schools and medical care, which in turn causes working age people to migrate to other countries in search for a brighter future. Of course a youthful population can also increase innovation and technological advances, but it is largely regarded that India’s population has been growing too quickly. To combat the growing population in the 1970s the government implement some controversial policies which included performing forced sterilisations on women. However, recently the government have been focusing on improving the economic status of women in India and this has had a huge impact on the fertility rate. The average woman now only has three children and there is more of a focus on providing contraception and educating women on why they should wait before having more children.